This comprehensive survey covers pollution control, in particular measures taken at Community level to deal with water pollution, air pollution, chemicals and waste. It also discusses legislation developed in wider contexts, such as environmental impact assessment, nature conservation, and the integration of environmental policy into other community policies, such as agriculture and development cooperation. The first title in Kluwer Law International's International Environmental Law and Policy series, the book must be viewed as a work of reference, to be used by industries and organisations involved with pollution control, as well as by those interested in environmental policy more generally. 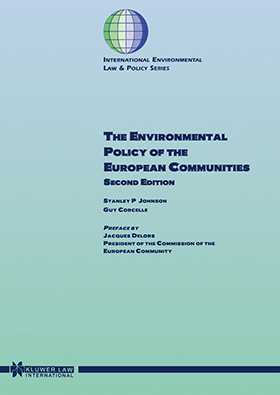 This new edition of The Environmental Policy of the European Communities , although it includes much that appeared in the first edition, has been totally rewritten, expanded and updated to include the key events and decisions that have intervened over the last six years, including the adoption of the Fifth Environmental Action Programme in 1993 and the impact of the Maastricht Treaty on the EU's environmental policy. The growing role of the European Community in international affairs is examined: for example, the participation of the Community in the Montreal Convention on Substances that Deplete the Ozone Layer is fully described, as is the Commission Communication to the Council on measures to be taken by the Community to deal with the greenhouse effect and the action taken by the Community both before and after the Rio Earth Summit.